The idea of workers owning the businesses where they work is not new. In America’s early years, Washington, Adams, Jefferson, and Madison believed that the best economic plan for the Republic was for citizens to have some ownership stake in the land, which was the main form of productive capital. This book traces the development of that share idea in American history and brings its message to today's economy, where business capital has replaced land as the source of wealth creation. 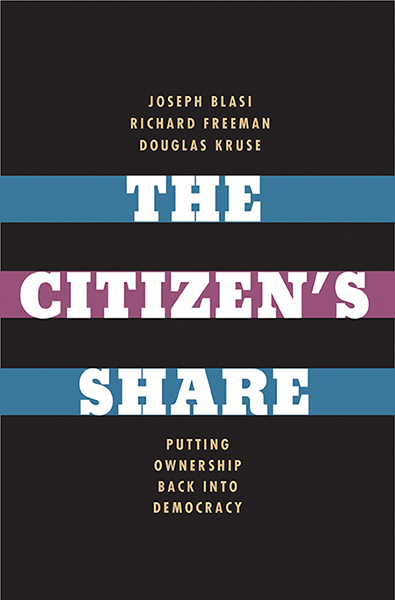 Based on a ten-year study of profit sharing and employee ownership at small and large corporations, this important and insightful work makes the case that the Founders’ original vision of sharing ownership and profits offers a viable path toward restoring the middle class. Blasi, Freeman, and Kruse show that an ownership stake in a corporation inspires and increases worker loyalty, productivity, and innovation. Their book offers history-, economics-, and evidence-based policy ideas at their best. To Purchase: Paper cover HERE.